Posts Tagged "korg triton extreme"
TGLOvers is an experiential electronica breakbeat track composed using a Korg Electribe RmkII drum machine. As a bonus, play this in your iTunes for cool podcast visuals and click-through links. Robert Goulet & Janet Jackson mixed to breaks and trance using two direct drive Stanton Str8 30′s and a Behringer DJx700 mixer. Drum ‘n Bass track featuring created with Dj Aske using a Korg Triton Extreme Keyboard, a Korg Synthesizer and Ableton Live 5 on a MacBook Pro. 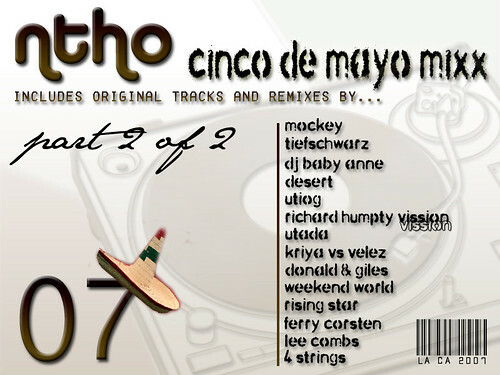 Electronic trance mix to celebrate the festive Cinco de Mayo holiday season. Mixed using 2 direct drive Stanton Str8 30′s, Behringer DJx700 mixer, an iPod, Korg Tritan Extreme keyboard and Ableton Live 5 on a MacBook Pro.